With my last order of Clinique products, they sent along a free sample of their High Impact Mascara, perfect for a Clinique mascara review. Based on the advertising claims, this Clinique mascara is designed to increase the overall volume of your lashes. The color is especially intense to further add to the bolder effects. Although it recommends the mascara be removed with an eye makeup solvent, it does not advertise any smudge or water proofing elements. On the Clinique mascara scale, their High Impact mascara is the most dramatic they offer. Out of all seven of the types of mascara they sell, this is the one offering the longest and thickest lashes, far from the natural lash looks. For this Clinique mascara review, I switched from my usual mascara for a week to give the Clinique High Impact the full study. After the week was up, I did not go back to my old mascara - I was hooked on the High Impact. With such a smooth, high-volume mascara, one quick swipe and I could instantly have beautiful lashes. 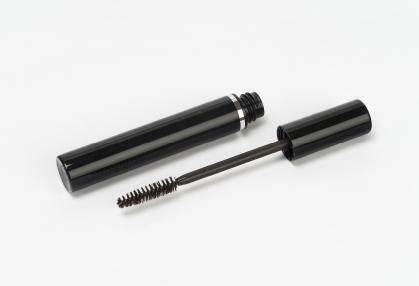 Although not designed to be waterproof, this mascara outperformed any other brand for staying power. Even after a long tiring day with sore over-rubbed eyes, this mascara did not bleed. The brush was thin and long, allowing me to easily cover my upper lashes with a couple of strokes and still delicately dab at my tiny lower lashes. After now using this Clinique mascara for over a month, I still have absolutely no complaints. As a Clinique product, the High Impact mascara is on the high side of average for price, $13.50 for a tube on their website. It is also only available in Black or Black/Brown. I tested the black, which was fine even for my fair complexion.